Begin by talking to the Zealot just north of Mort'ton. Firstly, talk to the Zealot who you can find while following the road to Mort'ton from the Mort Myre Swamp. 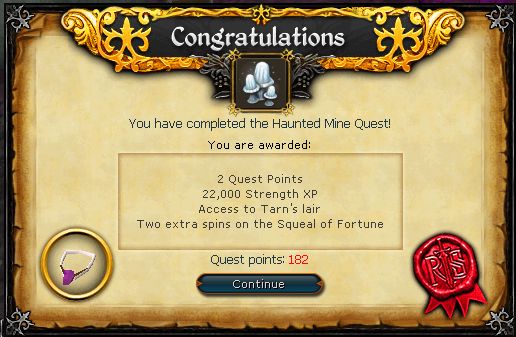 Say that you're a follower of anyone except for Zamorak, and he will tell you about the history of the Haunted Mines, how Treus Dayth still haunts the mine, and how he needs a sacred crystal to defeat the ghosts and win back the mine. Pickpocket the Zealot to get his Zealot Key, and then head south along the mine cart tracks. Climb over the Mine Cart blocking the way and crawl down the Cart Tunnel to find yourself in the mine. Now head west and climb through the next Cart Tunnel, and then walk south along the tracks and down the Cart Tunnel. Go down the ladder to the east, and then down the ladder to the southeast. To the west are some railway tracks with a moving cart, which you'll need to avoid. Head south along the tracks, hiding in the small openings on the side as the cart goes by. At the end of the tracks, climb down the ladder and pick the nearby Glowing Fungus. 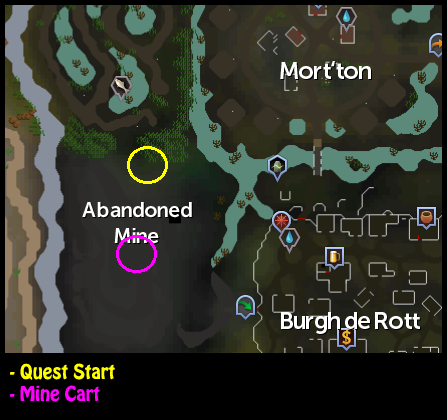 Now head northwest and use the Fungus with the searchable mine cart to put it inside. Head north, and then west until you see a Point Settings box on the wall. 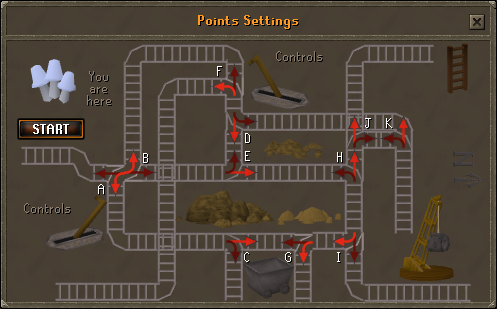 Clicking on this will bring up a diagram of the mine cart tracks, and you need to get the cart with the Fungus from where it currently is, to the other side of the mine. In order to do this, the tracks need to line up to form a clear path for the cart. There are 11 levers which can be pulled, each labeled from A-K, which you can examine to see which lever it is. Levers A,B,C,D, and E are to the east of the Point Settings box, while levers F,G,H,I,J, and K are to the north. Just have the red arrows from your Point Settings box match with the arrows in the diagram to the right. Then click on the Start button to see it reach the end of the track. If it sinks, you need to get another fungus and try again. Now head back to the glowing fungus, climb up the ladder and then run past the moving cart. Go up the ladder, head west and then up the next ladder. Go west again, crawl through the tunnel, head north, and then down the tunnel. Climb down the ladder to the east, head northeast and climb down the next ladder. Head west, climb down the ladder to the north, and then search the cart for the Glowing Fungus. Once you have the fungus, climb back up the ladder and then head as far east as you can, keeping north until you find a path that curves around and you reach another moving cart which only moves a short distance. Run past it, climb down the ladder and walk south until you find a Lift. Use the Zealot's Key with the Water Valve next to it, and then run back to the lift and operate it before the Mischievous Ghost gets there. If he gets there first, he'll turn off the water for it. Now head south, and then climb down the stairs to the east. Go east through the door, and then try and take the Innocent Looking Key on the crate. You will be attacked by Treus Dayth, a very difficult level 63 ghost. Using the Protect from Missiles Prayer or the Deflect Missiles Ancient Curse is recommended, as he throws Pickaxes at you. Your prayer will not prevent all damage, but it will weaken the blows. The cranes will also cause fair amounts of melee damage, so you should avoid them if you are standing still. Follow him around, attacking him when he stops until he is defeated. Treus Dayth has no weaknesses so no particular combat style is very effective against him, however Magic or Ranged is recommended since it allows you to avoid the cranes and carts better. 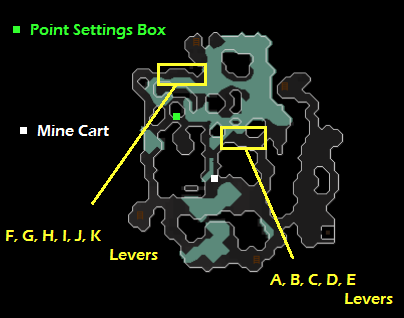 Take the Crystal Mine Key (Innocent Looking Key) from the crate, head back up the stairs, follow the passage west and climb down the stairs. Now go east, open the door and head southeast to the Crystal Mine. 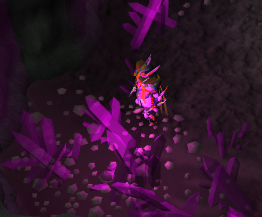 With a Chisel in your Backpack, just click 'Cut Crystal Outcrop' to get a Salve Shard and finish the quest! To create a Salve Amulet, use a Ball of Wool with a Salve Shard. It increases the wearer's damage and accuracy by 15% while fighting undead creatures and gives a +3 prayer bonus.